Work Load: 11 lbs (5 kg). This is the Alan Gordon Enterprises Super Grip DV Camera Support. The Super Grip Support System is a suction-based alternative to costly, time-consuming rigging. Ideal for action shots the Super Grip II mounts to somewhat flat, non-porous surfaces like the sides of cars, boats or planes and features an adjustable camera platform that works much like a tripod pan-tilt head. The Super Grip Junior has a 6" (15.24) diameter flexible-edge concave gripper and a built-in plastic pump with pressure warning indicator. Carries a work-load of up to 11 lbs (5 kg) and is ideal for mounting small film and video cameras or a variety of lights and sound recording equipment. Features a 2 3/8" x 3 1/4" (7 x 8.2 cm) diameter mounting plate with a 1/4"-20 attaching screw in the center. Features large easy-grip ratchet handles. Attaches to flat or curved, smooth, non-porous surfaces. Red-line indicator warns of any vacuum loss. Box Dimensions (LxWxH) 8.25 x 7.8 x 7.4"
DV Super Grip is rated 4.8 out of 5 by 9. Rated 5 out of 5 by Leonardo B. from Excellent Grip! I use the Super Grip to attach my camera mostly to my car. I have put it on the windows as well as outside the car and it works perfect. I use a Nikon D300s with different lenses but specially Rokinon 8mm T3.8. At first I drove very slow just to make sure the pump was doing its job but decided to go faster as it handled bumps very well. I have used Avenger F1000 and it works great too but you need to buy a lot more accessories to make it work in three axis as Alan Gordon's does. It's been only two weeks since I received it but I totally recommend it. Rated 5 out of 5 by Carla from This thing Really Socks! Professional quality suction grip for mounting lightweight camera or (with a 5/8 adapter) sticking a kicker light almost anywhere there's a smooth surface. This works really well for its intended applications - I recommend that you add a safety cable if you're doing vehicle shots with one of these. We added this to our grip kit along with the Matthews 3-cup car mount to cover all the bases. Also, when it arrives take it apart and add LocTite to the threads holding the parts together so it doesn't come apart when you twist and turn them during normal adjustment of the friction locks. The Delkin 'Fat Gecco' (B&H # DEFGM) suction mount might be a bit better for lightweight camera applications at about half the price - it has double suction cups (that are a bit smaller than this Alan Gordon unit) so if it starts to let go you have more warning. Always mount this one so you can see the 'suction indicator red band' on the hand pump. We use both this Alan Gordon unit and the Delkin interchangeably - this one may be slightly more rigid because of fewer joints and metal instead of plastic riser pieces. If you are looking for a bit of kit to attach a camera to a car and shoot while moving be aware that any of these 'single cup' units will vibrate while driving and give poor picture stability. You really need to 'triangulate' the mount with at least three mount points to give stability. This gripper can work as a low perspective 'hi-hat' mount if you stick it to a floor... Add a fluid head for film/video work. This is a well made unit, pro quality all metal (except the rubber suction cup, of course!) It looks like it will have a long and prosperous life with us. Rated 5 out of 5 by Anonymous from DV Super Grip by Alan Gordon Enterprises I received my DV Super Grip very quickly from B&H and was very impressed with the overall quality of the mount, sturdy construction and incredibly strong and sturdy platform for my camcorder. Great job, I'll be coming to B&H for more of my photo and video needs. 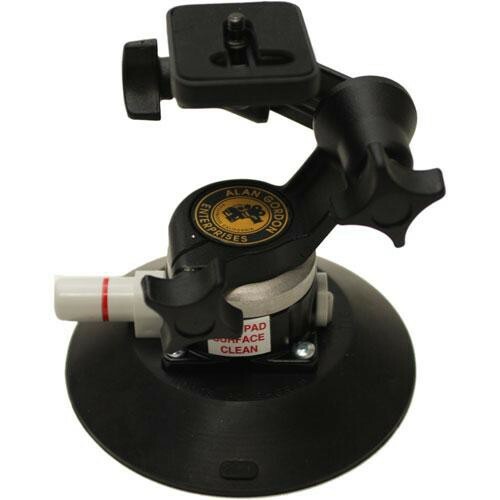 Rated 4 out of 5 by Maya S. from Smooth Ride Required This is a very fast suction mount with a reliable grip system. It would be amazing if the tripod head itself had a little shock absorption to compensate for road and vehicle vibrations, but given the simplicity and price, a great tool. Rated 5 out of 5 by Casey S from It's bigger and better then it looks I got this to do interior car shots with my 5DMK3. I'm tired of the GoPro look and quality. When I received this it was much bigger in person then the photos makes it seems. It's sturdy and tight really easy to use. Rated 4 out of 5 by high volt from Delivered more than I expected used as a car mount for my Blackmagic pocketcam. suction worked on curved profile on car door, never showed any sign of losing grip. it is also incredibly easy to release. Rated 5 out of 5 by Dan M. from Totally solid This is a great foundation for mounting a medium sized DSLR such as my 5dmkiii onto a car. To get it really stable, you need to triangulate with a couple more cups. Does anyone have any in use images or information for reference?